The Energy Futures Lab’s Strategic Communications Director, Delyse Sylvester introduces the Lab’s public engagement strategy. Most system change processes focus almost exclusively on technological innovation and large-scale policy shifts to integrate and scale the innovations. The EFL recognizes that engaged citizens co-create a receptive culture, and that this is essential to the long-term success of new innovations. The Energy Futures Lab is all about transitioning Alberta’s energy system for a sustainable future. But what do we mean by the “energy system” exactly? Are we talking about oil and gas or renewables or both? What about the electricity generation and transmission infrastructure? All of those are part of the system. But those are talking about physical things, raw materials and their transportation. What about how we actually use energy? The Energy Futures Lab is very pleased to announce the support of the Alberta Real Estate Foundation (AREF). 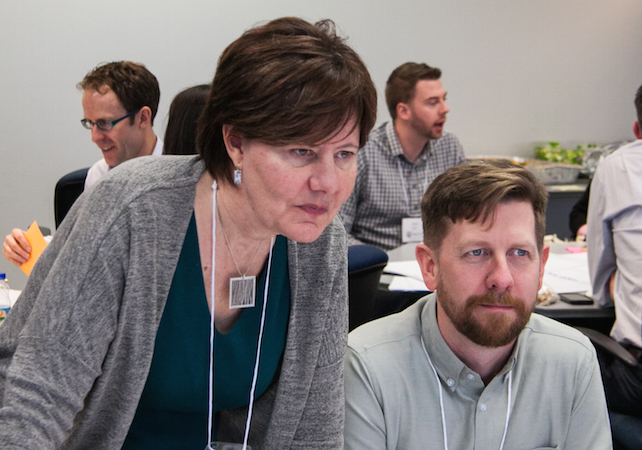 AREF’s Board of Governors has approved a grant of two hundred and fifty thousand dollars ($250,000.00) to foster community engagement with a focus on energy literacy across Alberta. Do we have time to play games? Do we have time not to? Imagine 20 years of energy transition condensed into an immersive half day simulation. The Newtonian Shift drops you into the outdated, inefficient, polluting energy system of Newtonia. You may find yourself working for a utility, or a bank. Or maybe you are a First Nations leader, oil and gas producer, or the director of an environmental non-profit. Megan Zimmerman & Barend Dronkers: What is Community Energy? Energy Futures Lab Fellow Megan Zimmerman and Barend Dronkers from the Pembina Institute recap last month’s Calgary community energy workshop. A group of diverse stakeholders came together to discuss opportunities and best practices in Alberta for local energy development and ownership. Energy Futures Lab Director Chad Park speaks to GLOBE 2016 attendees at the Walrus Talks Energy event. Chad’s talk challenges the simplistic approach of ‘with us or against us’ debates, and calls for new dialogue to enable the transition to a carbon competitive economy.